Hybrid Parks organised four open conferences between 2012 and 2014. During the Final Conference international speakers presented the unique resources of parks, the advantages of cooperation and the need to achieve additional economic, social and environmental benefits thanks to hybrid parks. According to the three strands of sustainability these presentations covered economic, environmental and social issues. Presentations were given by duos formed by a representative of the partnership, summarizing the project’s activities and outcomes, and by an external expert each. Input by the external experts included reports on their own experiences and projects and on other good practice examples as well as recommendations for future activities in parks and gardens and for cooperative projects. However, and different from the standard triangle of sustainability, the conference included “culture” as a fourth strand. This was done in order to emphasize the cultural dimension, which is usually integrated into the social facet of sustainability. But gardens are an essential element of the European heritage and culture and there are strong relations between gardens and other arts. Accordingly the two presentations on cultural aspects are summarized in more detail below. 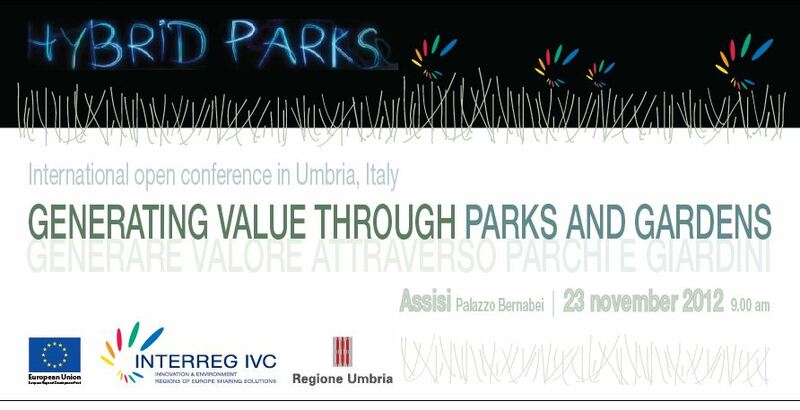 Finally two lectures analysed the project’s findings and examined if there can be a Hybrid Parks Model that is applicable to a majority of parks and gardens in Europe. Study tours in and around Cologne on both days completed the programme. On the first day the conference started with introductions by Milena Karabaic, Head of the LVR Department for Culture and Environment (Germany), who was hosting the event, and by Alan Thornley (UK), chairman of the International Steering Group of Hybrid Parks – who also closed the conference at the end of the second day. Then Katja Ecke, Finance Officer at the INTERREG IVC Joint Technical Secretariat in Lille (France), reviewed the INTERREG IVC Programme and gave a short outlook on the new programme INTERREG Europe that will be operational in 2015. “Parks and Gardens – More than nice pictures” was the title of the kick-off address by Philip Smith (UK), CEO International Garden Photographer of the Year. More than 20.000 contributions from 149 countries show both the great variety and the global interest in the values and the beauty of parks and gardens. A touring exhibition, shown at parks, gardens, museums, art galleries and other venues worldwide communicates this message, commitment and appeal worldwide. In the first section of a joint presentation Wolfgang Rembierz, State Chancellery of North Rhine-Westphalia (NRW), demonstrated the growth of settlement areas in NRW and the tradition of policies to safeguard green belts. Preservation of the variety of cultural landscapes, sustainable cultural landscape development and consideration of climate change in the design of parks and open spaces are important issues in actual policies in NRW, but similar approaches been applied and discussed in other project regions as well. Evamaria Küppers-Ullrich, Ministry of Building, Housing, Urban Development and Transport of NRW, presented the successful ecological urban restructuring of brownfields, conversion areas, urban neighbourhoods and city centres. These actions, and in particular the enhancement of parks and urban spaces within this context of integrated urban development, help implementing the objectives postulated by the state government in the Green City Strategy and the Liveable City Scenario. The importance of urban green in modern cities was the main topic of the presentation by Dr. Roland Bernecker, Secretary-General of the German Commission for UNESCO. Parks are very popular on the World Heritage List as they reflect the relation between mankind and nature. Since 2007 the majority of people on our planet, for the first time in history, live in the suburbs of the cities and no longer on the countryside. It is crucial to manage this process as sustainable as possible. Parks are indispensable places for the people to slow down, to relax and to breathe. Economically, parks and gardens in cities are of emergent importance as locational factors and for tourism as a fast growing economy globally. A while ago, so Pawel Kojs, Director of the Silesian Botanical Garden in Mikolów (Poland), his work was mainly determined by the preservation of biodiversity. Then the Hybrid Parks project and its professional exchange revealed the importance of communication with the visitors. Exhibitions and garden shows are as important for a sustainable environment as seed banks for local plants. Beautiful gardens help to raise the awareness for the protection of nature and of our planet. The project also initiated a network to promote regional parks and gardens to the local population, to decision makers and tourists. Todd Forrest, Vice President for Horticulture and Living Collections at The New York Botanical Garden, discussed how this garden has continued to grow and evolve by embracing the principles promoted by Hybrid Parks: providing economic opportunities for its neighbours; broadening its audience through the creation of diverse programs; and increasing awareness of how environmental change is impacting the living world around us through new gardens and displays. His presentation focused on three areas: the garden’s exhibition program, which combines art and horticulture to explore how plants and gardens have inspired the work of noted cultural figures; the garden’s children’s education initiatives, which serves 90.000 New York City schoolchildren each year; and the ongoing restoration of the garden’s historic landscape with an emphasis on implementing more sustainable and environmentally friendly practices. In order to contribute to the social dimension of sustainability, parks and garden, according to Cecilia Liljedahl, member of the management team for Göteborgs Lustgårdar 2016 (Sweden), should connect people with each other and connect urban citizens with nature and culture in a social and healthy context. Experiences, mainly from a project in a housing district in Linköping, show that urban gardening is a tool for user participation and responsible production and consumption. Urban green provides the social meeting places and areas for recreation needed by all social classes and generations and helps to include the increasing immigrant population. Michele Mellara, film producer and director from Italy, introduced his outstanding film “God Save The Green”. It is a documentary that tells the stories of people who are regaining a sense of community through gardening while changing their lives and the places they live in. One example is a family growing vegetables in large bags filled with soil from the forest surrounding Nairobi’s slums. While this is vital to ensure the family’s subsistence, other projects, such as Urban Gardening in Berlin-Kreuzberg, aim at creating new urban spaces and networks while growing healthy food too. Geoffroy de Longuemar, President of The Association of Parks and Gardens in Brittany (France), presented art as an important cultural aspect in gardens and as a donor for heritage protection. A garden is mainly made out of natural objects, but it is also made of ideas, of architecture, of a whole range of shapes and colours, which relate gardens to paintings and sculptures. Moreover, maintaining gardens often means working with nature against nature. Much violence is done to nature in gardens, in the name of culture. Sometimes gardens seem to be out of the world, but they are part of a changing historical and economical context. Economic considerations now drive the actions of owners more than ever before. It has become a rule to open private spaces to the public. A touristic orientation is a common way for private and public owners of generating income and of maintaining estates. The promotion of gardens is well enhanced by networking and by promotional tools such as websites and brochures. But for the media there always needs to be something new to feed their curiosity. This introduces the necessity of events and the idea of art in the gardens. Being a work of art, a garden has its own artistic equilibrium and perfection. Introducing a work of art into a garden requires thoughts about a constructive interference between the two. The director of “Giardini La Mortella” on Ischia presented “Music and landscape as a driving force for a cultural enterprise” during our Assisi conference. The garden around the house of the composer Sir William Walton was designed since 1956 by the famous garden architect Russell Page and now combines the art of music with the musicality of the garden, bird singing, and sounds of water and refers music to the harmony of plants in their different colours, foliage and forms, the rhythms of light and shadow. At la Ballue in Brittany a real musical life is organised all year long, with high quality chamber music. Parks are also wonderful places to exhibit large sculptures, like Kerguehennec and Le Bois Orcan in Brittany or Insel Hombroich in Neuss (Germany). Thus art and gardens are good allies to keep heritage alive. Moreover, the marriage of art and gardens is a very good example of a hybrid operation for parks and gardens. Ed Bennis, former professor at Manchester Metropolitan University (UK), spoke about continuity and change of the garden patrimony. The years pass and gardens grow, mature and decline frequently without notice. Daily, the light and weather changes our view and perception while the seasons gently merge and move the garden into a new but recurring time frame. The work of man has a more immediate impact. There is a rich physical, cultural, artistic and environmental history of gardens across Europe with influences from many times and cultures. 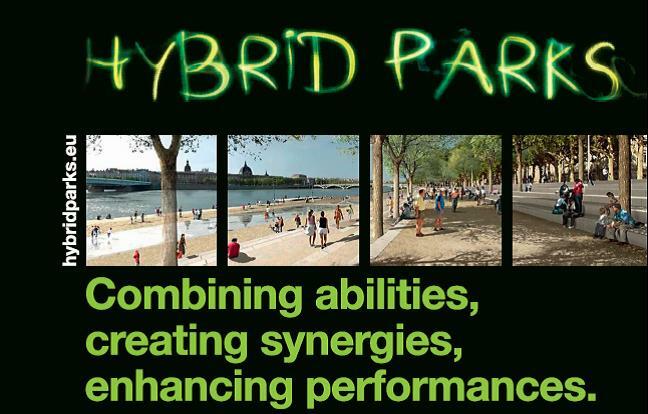 Hybrid Parks is about the role and diversity that parks can achieve with considered change. Change that is sensitive, inventive and appropriate to today’s society. Het Loo is an example of change where the 17th century formal sunken garden was replaced by an English landscape park and changed again in the late 20th century when the formal gardens were reinstated as a symbol of national identity and the economic value of the Dutch horticultural industry. Lincoln Center was replanted with different tree species, a different arrangement of the trees and different under-planting. What has been lost is the atmosphere, particularly the role of light and shade. The design concept was ignored and the result lacks the subtlety, sophistication and beauty of the original. Oulton Park (UK) is a designed landscape from the early 19th century. Its current use as “the most picturesque racing circuit in the UK” is highly controversial. However, the fabric of the landscape remains. Oulton has found a new use that works and has saved this valuable landscape. Not all parks and gardens are suitable for restoration, but most are certainly suitable for new layers of use. Uses that support and enhance our lives, which are manageable and sustainable socially, economically and environmentally. But a key in any decision is that the actions taken are reversible. Each park and garden is unique and each needs to be understood and treated individually. It is not money, but our imaginations that restrict the future role of our parks and gardens. Most presentations hold during the conference are available from this page. Some impressions from the event can be found here. The agenda is available as download here. During the last decades the economic development of Rhodes centred on tourism with the mild climate, the sea and the beaches and some of the exceptional heritage sites as main assets. The interest of the tourists and many inhabitants alike did not encompass the rich biodiversity, natural landscapes, parks and gardens on the island. As a positive effect, natural spots of high quality, flora and fauna remained almost untouched. On the other hand, many public parks and gardens and open spaces were neglected. Today, there is an increasing interest to develop those sites, by the politicians and other officials, by tourism experts and by the local population. Those who manage parks, areas of natural beauty or rich biodiversity are keen to employ sustainable development schemes increasing the social contributions and economic benefits of their sites too. During the first day of the conference presentations given by external experts and by partners showed the wide range of assets for sustainable development policies, the enhancement of the environment and for hybrid parks. Presentations by guest experts included: “The Regional Nursery of South Aegean and the Botanical Garden of Rhodes: Sustainable development and their environmental, social, educational aspects”, “The role of parks in the South Aegean Region”, “Wild growing and endemic flora – potentialities of exploitation”, “How cities could use parks and green spaces for climate change management”, “The Valley of Butterflies: The protection of a unique biotope”, “The new development plan for the Municipal Flower Garden of Rimini Square”, “Sustainable exploitation of wild growing plants: The strategy of the Balkan Botanic Garden of Kroussia”, “The contribution of parks to environmental awareness”. Partners talked about “The European Vocational Competition for Young Gardeners”, “Ecological maintaining of public and touristic used parks” and “The European Garden Association – “Natur im Garten” International”. Finally the outcomes of the study to investigate the possibility of identifying an economic value for Hybrid Parks were presented on Northwich Woodlands as the pilot site, but also as a methodology and model to be used elsewhere. During the next two days many of the sites were visited. After a stop at the Municipal Flower Garden of Rimini Square, a garden inside the medieval walls that will be rehabilitated, the tour continued at the medieval moat and on the fortifications around the medieval town of Rhodes. Then the garden of the Marc de Montalembert Foundation was visited. This garden is a modern reconstruction of a historic garden combining medieval, Ottoman and Arabic elements with a strong Mediterranean character. By coach the group arrived at the Regional Nursery of the South Aegean where the Botanical Garden of Rhodes is under construction. The group followed the Path of Biodiversity and tasted local products, two of the educational activities here. Next was Kallithea Springs and Garden, known from ancient times for its healthy sources. The next day started with a workshop at Rodini Park that stretches along a green and shady bed of a stream not far away from the city centre. Participants discussed how the accessibility and use of this park with its unique features and qualities might be improved. After a stop at the Museum of Natural History of the Bee, a private investment of increasing environmental, economic and tourism relevance, the trip continued to the Valley of Butterflies. The valley is a unique biotope because it is the only natural forest of Liquidambar orientalis (Oriental Sweetgum trees) in Europe, and a resting point for the Jersey tiger (Panaxia Quadripunctaria), a nocturnal moth. The conflict between the vulnerability of the site and the increasing interest by tourists and local people could be solved by investments in new paths and railings and by awareness raising and control activities alike. The presentations that were given during the conference are available from this page. This event combined an open conference with its strong focus on green infrastructures and their social effects and study trips to explore some of the historic gardens and contemporary landscape projects in the region. Presentations by and a workshop with renowned guest experts gave substantial new input for the development of Hybrid Parks. The study tours allowed a very beneficial professional exchange between the international partners and the local experts. The presentations hold during the conference are available for download from this page. Hosted by Umbria Region this conference focussed on the professional exchange of knowledge and experience and on the interdisciplinary transfer of best practices. The presentations and discussions (see agenda as PDF) showed the great variety of strategies implemented by institutions, economic entities, the public sector and private owners to find models of sustainable management both at the economic and the environmental level. The variety of these solutions depends on many different factors: type of asset (natural reserve, park or garden), ownership (public or private), predominant function (recreational, productive, educational, etc.) and availability of regulatory instruments. During the conference, a poster exhibition (collected through an open call for papers) showed examples of realised best practices concerning the enhancement and the management of parks and gardens based on the three main themes of the project: Raising awareness of environmental issues; User enlargement and social relapses; Economic development and tourism. The programme is still available as download in English and Italian. The entire conference has been recorded and the proceedings (videos etc.) have been published on a DVD which was distributed in the professional magazine for architecture and landscape architecture “Topscape”. See this link and this link for details.